What if William Shakespeare was a self-absorbed, cocky, celebrity rock star? What if, for as many people that loved him, there was just a couple of playwrights who found him overrated? What if, during the Renaissance period, a cultural movement abundant with new ideas in art and music, these two playwrights sought to claim his spot in theatre history by devising a new form of entertainment called "the musical"? Well, in Something Rotten, you can watch that happen. Something Rotten has certainly grabbed my attention. After all the different versions, interpretations, revivals, and variants of Shakespeare that everyone has been bombarded with since high school, it is refreshing to see something that pokes fun at Shakespeare himself while focusing on the phase in the evolution of theatre after Shakespeare; the musical. Think about it. William Shakespeare was one of the biggest names in Europe in the 16th Century. Heck, he's probably one of the biggest and most recognizable names in history. One can see that type of fame going to a person's head. So I'm excited to see Shakespeare with an inflated, rock-star ego! It calls for great comedy. 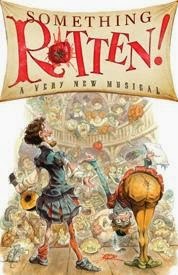 Expect a lot of laughs, flashy scenery, and, especially, show stopping musical numbers in this musical Something Rotten. It opens April 22nd at the St. James Theatre. However, it is previewing now and tickets are available at great rates here at Applause! Call now and speak to one of our incredible ticket experts to secure your tickets. Have an entertaining day, theatre lovers!